This report tracks the rise of crude-by-rail in North America, detailing where crude trains are being loaded and unloaded, how many trains carrying crude oil are crossing the North American continent, and who is involved in this burgeoning trade. 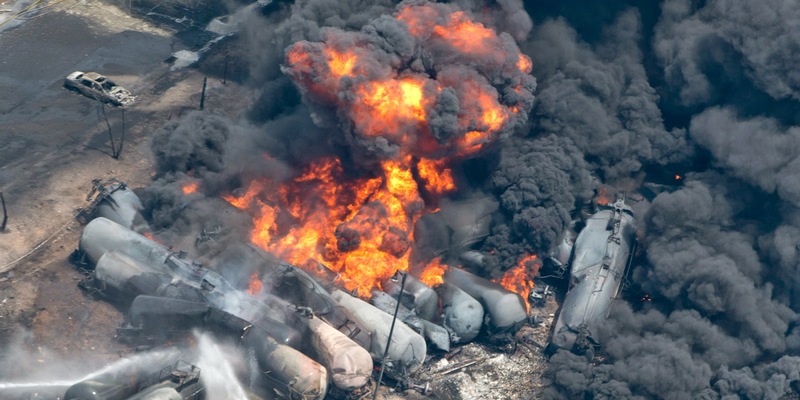 Future reports in this series will look at the economics of crude-by-rail, safety, and climate change issues. Please see www.priceofoil.org/rail for the map and links to reports and data. The growth of crude-by-rail in North America has been primarily driven by the relentless growth in fracked oil (known as light tight oil), which is at the heart of America’s ongoing oil boom. Today there are 188 terminals in Canada and the United States actively loading and unloading crude oil onto and off of trains. At least 33 of these terminals are expanding their capacity to handle more crude. An additional 51 new terminals are under construction or planned. Over 800,000 barrels per day (bpd) of crude oil were shipped on U.S. railroads in 2013, a 70-fold increase from 2005. Including Canada, total North American crude-by-rail shipments are currently around one million bpd. However, crude-by-rail loading capacity is already at 3.5 million bpd, which is 3.5 times the current traffic level. By 2016 capacity could grow to over 5.1 million bpd. We calculate that if one million bpd is being loaded and unloaded then roughly 135 crude oil trains of 100 cars each are moving each day through North America. This means that at any given time, there are around 9 million barrels of oil moving on trains through North America. If all the operating, expanding, under construction, and planned terminals were utilized to full capacity, it would entail some 675 trains with 100 cars each, carrying a total of around 45 million barrels of oil through North American communities every day. BNSF, owned by Warren Buffet, carries up to 70 percent of all the crude-by-rail traffic in North America today. This railroad alone expects to load one million barrels per day onto its network by the end of 2014. Many of the U.S. crude-by-rail terminal operators operate as Master Limited Partnerships (MLPs). These companies avoid corporate level income taxes entirely and distribute cash to shareholders on a tax-deferred basis. This translates into a massive subsidy for crude-by-rail operations. Communities need to organize to stop this runaway train in its tracks. This report and the online map that accompanies it seek to assist that process by providing data on what the crude-by-rail industry is doing, where it is operating, and what is has planned. Go to the crude-by-rail landing page for the interactive map and further information.